Anything and Everything: College Rejection Letters Gone Forever? When we were seniors in high school, we went through the lengthy process of applying to the various colleges that we had our hopes and dreams set on. Do you remember the anxiety we felt while waiting to hear from each of the schools? And do you remember the feeling of our stomachs dropping when we received a rejection letter from the college that was at the top of our list? Ok, well that last part may only pertain to a select few of us (yes...me included), but we can all agree that receiving a rejection letter from a school we had hoped to attend would certainly hit us where it hurts. While the app seems to work (it's in the beginning stages), there are a few underlying questions that need to be answered before prospective students throw all of their information to these two companies. 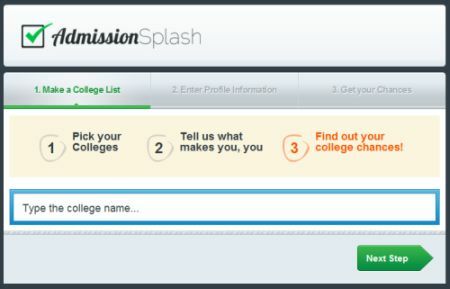 First and foremost, this new app requires a lot of personal and demographic information that would seem to have no bearing on anyone's ability to get into a college, such as one's address. This makes the app look a little suspicious, as people might make it out to believe a simple data mining exercise for Facebook and SSN. In his blog, professional Art Director and Designer Michael Leo wrote an article about the rise of Facebook applications that have underlying intentions to harvest demographic data from consumers. This is a direct violation of privacy on the consumer and tons and tons of people are falling for such applications. Is the new AdmissionSplash app just the next one in line on this list? Second, the question needs to be asked: can an app or algorithm truly be developed to help predict whether one will be accepted to a certain college? And if so, can it ever be reliable? While results for UCLA have been accurate for this new app, that's not to say it works for the other colleges. That said, if people do try it out, will they believe the results? The consequences can be detrimental if one tries out the app and it informs him/her that the chances of him/her getting into a school are not good. As mentioned before, it's not 100% accurate. It's not full-proof. It isn't the "real thing." Someone who is rejected by the app can just as easily apply to the school and get in. Thus, I don't know whether this app should be trusted. Questions will continue to linger around this app for as long as it is in existence about whether it can be trusted or not. Is it just a data-mining attempt by Facebook and SSN to get more information on consumers? Are the results it produces reliable enough? What if one is rejected by the app but in reality, he/she would've gotten into the college had they applied? When it comes down to it, I don't know if I'd be able to trust this app. Thankfully, I've already been through the college application process, so I will not have to worry about ever using this app. But for those who will, I stress a heavy word of caution.